Judging only by the first wave of enemies in Super Hydorah you’d be forgiven for thinking it is just a Gradius clone. I mean it’s exactly the same. Play just a tiny bit further, though, and Super Hydorah quickly establishes its own identity with a much steeper difficulty curve, unique power up system, and branching paths through its campaign. With great feeling controls, deliciously oldschool presentation, and surprising amount of content, Super Hydorah is a throwback homage SHMUP fans will love. It is very, very difficult, though, even by notoriously difficult SHMUP standards, but that just means it’s all the more satisfying when you win. Continue reading our full Super Hydorah Xbox One review for all of the details. 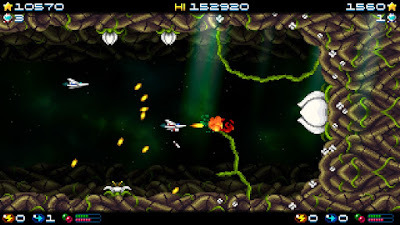 Super Hydorah is a throwback to oldschool side-scrolling shoot-em-ups like Gradius and R-Type. You fly from left to right as the level scrolls towards you bringing enemies, power-ups, obstacles, and more into your path. What makes it interesting is that you have a lot of control in determining what power-ups you pick up, which has a dramatic impact on your path through a level. Special enemies drop power-ups that cycle between speed, shield, or special weapons (like bombs) and you pick the one you want by waiting for it to change color. Regular enemies drop red and green icons (that, again, cycle between them so you just wait to pick up the color you want) that upgrade your main and secondary weapon. Depending on what upgrades you choose to pick up you will have a harder or easier time through a level. That’s cool. The customization gets even deeper the further into the game you get because you unlock new weapons after each level you beat. At first you’ll start the game with simple blasters and bombs, but beat a few levels and suddenly your arsenal has a ton of interesting and unique weapons to choose from. Selecting the right combination of weapons before each level can make a big difference. One thing that can’t be understated about Super Hydorah, however, is just how bloody brutally difficult it is. 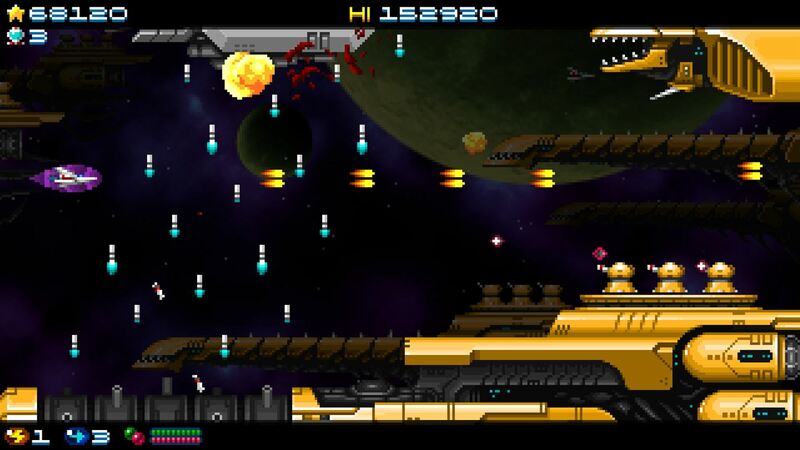 Even in a genre that is notorious for producing difficult experiences, Super Hydorah stands out as being particularly tough. Everything is a one hit kill, unless you have a shield so you have an extra hit (but picking up shields means you have less bombs ...), so absolute precision and concentration is required to get through a level. The levels do have checkpoints, as they are made up of multiple parts, but when you run out of continues you have to re-start the level over again. There are no infinite continues or practice mode or other modern SHMUP quality of life improvements here. This is pure, difficult, oldschool, challenging, shoot-em-up bliss. I’m not going to lie, Super Hydorah can be incredibly frustrating. I love SHMUPS and have played dozens of them (see our Raiden V, Ghost Blade HD, Solar Shifter EX, and Sky Force Anniversary reviews) but by the second level here I was already struggling. It isn’t as if it ever throws a ton of enemies at you or a blinding screen-filling hail of bullets, either. Super Hydorah’s difficulty comes from having to memorize enemy placement and patterns and then the absolute precision required to navigate through it all. One lapse of concentration, one slip on the controller, or being just a pixel or two out of position will ruin a run. Despite being slower and simpler and far less hectic than a Japanese bullet-hell game, Super Hydorah is somehow more intense and exhausting to play. It’s fun, though, because it is also absolutely fair. When you die it is 100% your fault. Learning the levels and beating tough areas is incredibly satisfying. You keep coming back again and again and again because you know you can do better. It is addictive and rewarding in all the best ways that made fans fall in love with SHMUIPS in the first place. Super Hydorah is awesome. The presentation in Super Hydorah is beautifully oldschool 8-bit-style visuals complete with optional CRT filters. The graphics are typically bright and colorful and there is a nice variety to enemy designs and backgrounds. Overall, Super Hydorah is among the most difficult shoot-em-ups available for Xbox One, but it is also one of the most fun and satisfying as well. Oldschool fans of the genre will definitely love the lack of hand holding and high level of challenge. There is a lot of content here, too, with 21 levels, tons of upgrades, solo and local co-op modes, and an extra unlockable minigame. Shoot-em-up fans will love Super Hydorah. Buy it.